Michelle Obama photobombs The Miami Heat. 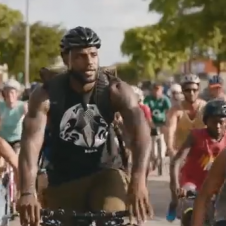 On a recent trip to the White House, Dwyane Wade, Ray Allen, LeBron James and head coach Erik Spoelstra were putting together a video for Michelle Obama's "Let's Move" program. As coach is interviewing Allen and Wade, James holds up a mini hoop and the First Lady throws down a dunk. Two for M. Obama. You need this in your life. Text as you see necessary.